Ardens provides three packages which contain a varying amount of localisation, including Starter, Plus and Pro. For further information, please see below. Ardens can also provide a Referral Management tool called Ardens Connect. For more information on this, please contact us. 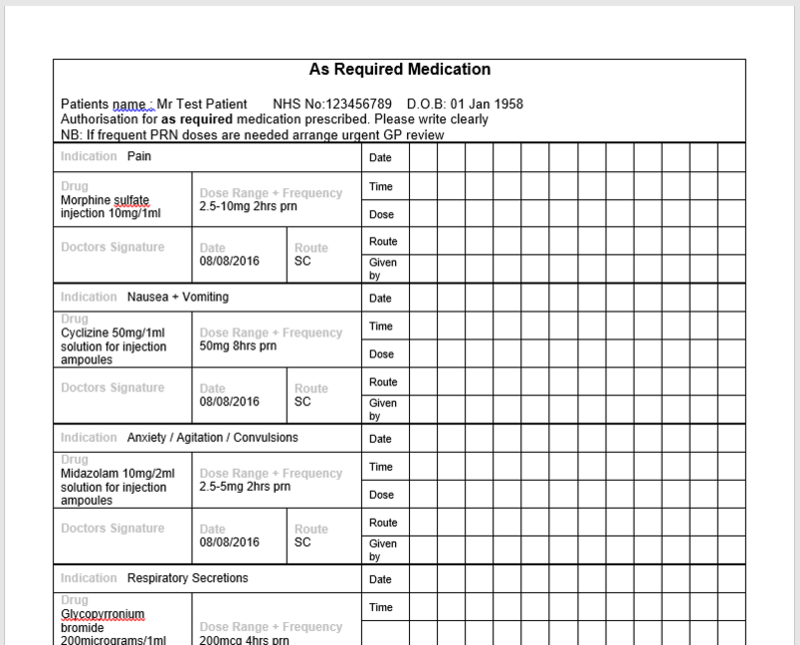 Ardens Plus greatly simplifies End Of Life prescribing. 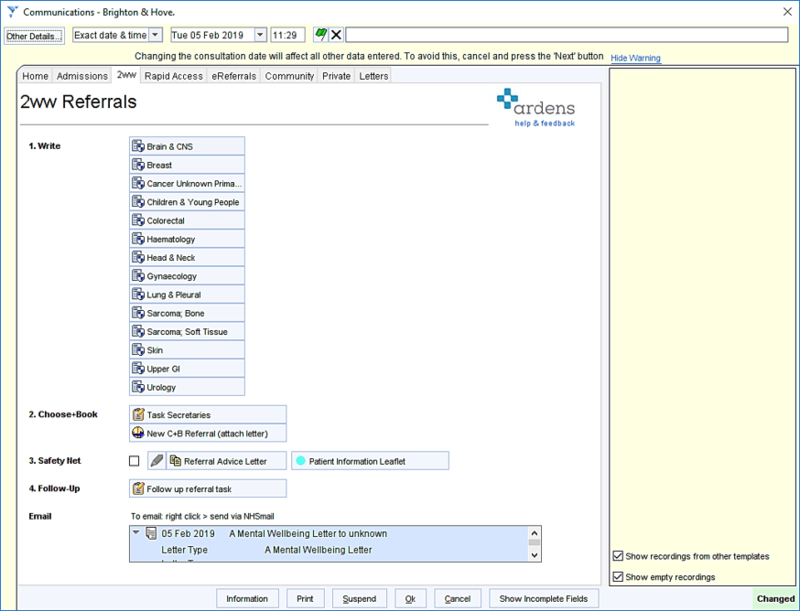 To access the ‘End of Life’ template go to autoconsultation > ardens Consultations D – L.
At the bottom of the ‘End of Life’ template is a link to the ‘EOL Formulary’. On the EOL formulary click to prescribe & print your EOL medications. Then click the ‘Community Drug Chart’ which automatically merges the prescribed drugs, so you can just check, print & sign. 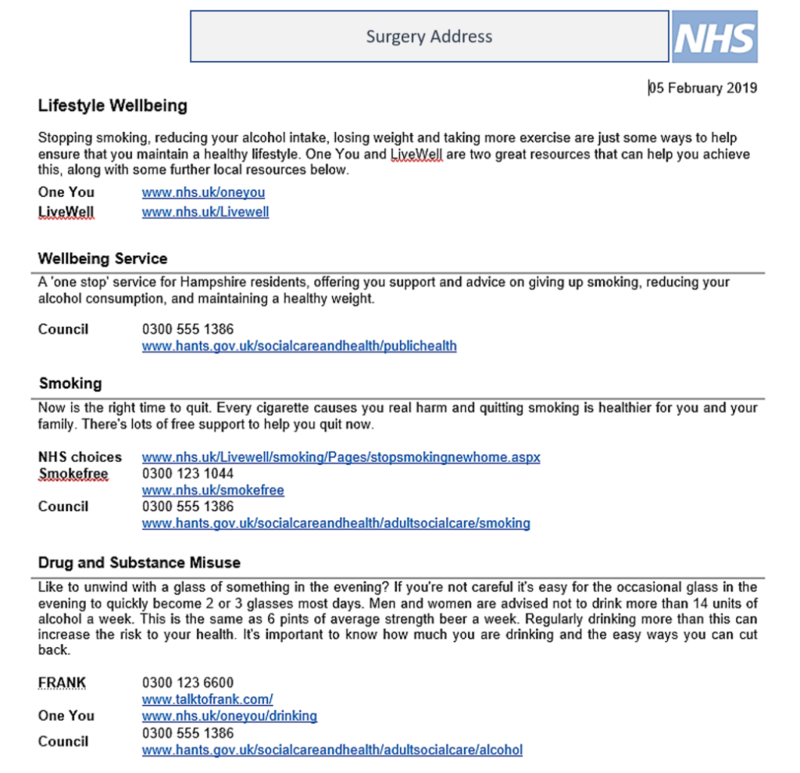 To access this, click the ‘Doctors Bag’ icon under the patient’s name – ‘General > Vitals & Lifestyle’, you will then see the ‘Lifestyle Wellbeing’ Letter. It can also be found on all the tabs of the ‘NHS Health Check’ template and on the ‘Care Navigation and Signposting’ template. For further information please see the Support Desk Article. 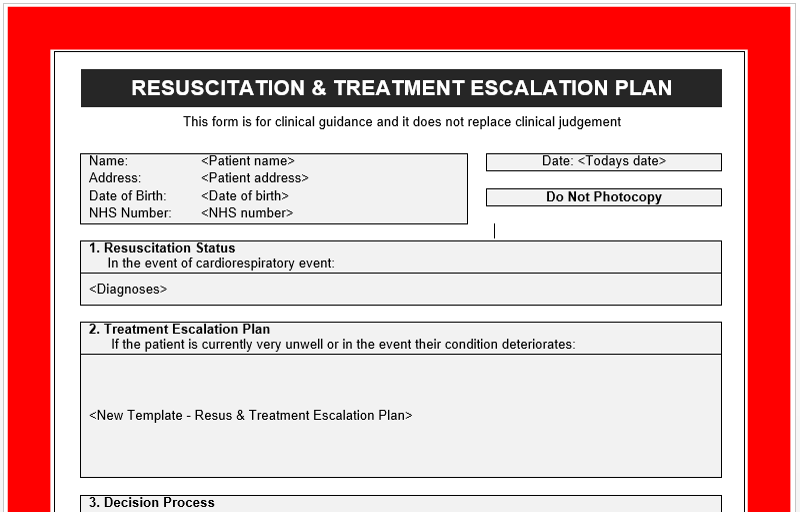 The LES templates & reports ensure all your local service specifications are all in one place. This saves you hunting in folders for this & wasting valuable time. All you need to do is email us a copy of your service specifications and we’ll do the rest. If any changes or updates are made, please just remember to let us know too. Mental health is often a component of many Primary Care Consultations. Having quick access to services that you can signpost your patients to is essential. To access this, click the ‘Doctors Bag’ icon under the patient’s name > Psychosocial tab. 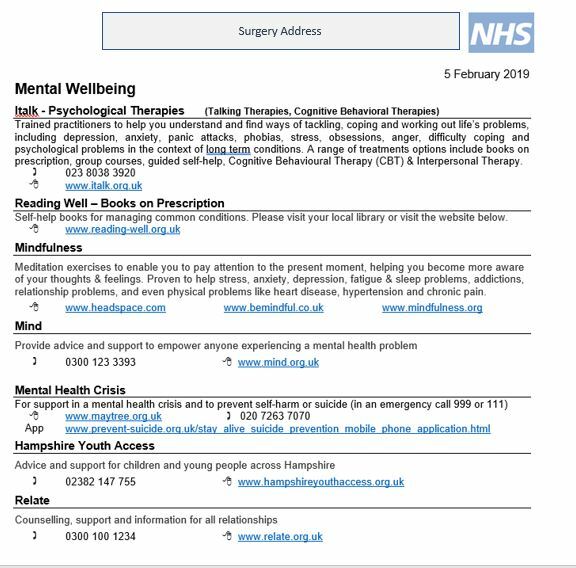 You’ll see the Mental Wellbeing Letter next to the leaflets. It can also be found on all the Mental Health consultation templates too. The referral process is often fraught with potential dangers and can easily lead to significant events. To help reduce the likelihood of patients not attending an urgent hospital appointment, Ardens has a quick ‘Safety Net Referral Advice’ Letter. You can easily print this out during your consultation to give to your patient. This will not only ensure that the patient gets to their appointment, but will protect you medico-legally and will also reduce some of the calls your surgery gets asking you to chase up referrals. To access this letter, click the ‘Doctors Bag’ icon under the patient’s name. You’ll see a ‘Referral safety net advice’ tick box & a link to ‘Launch Safety Net’. Ardens can give you quick and easy access to your local Resus Form. This can save lots of time & ensure that everything is completed easily and accurately. Just email us your forms and we’ll add them to SystmOne for you. To access this, on the ‘Resus & TEP’ template you’ll see a link to print this. The form will automatically merge the appropriate fields. Add your colour printer to your surgery network so you can print this from your own room. 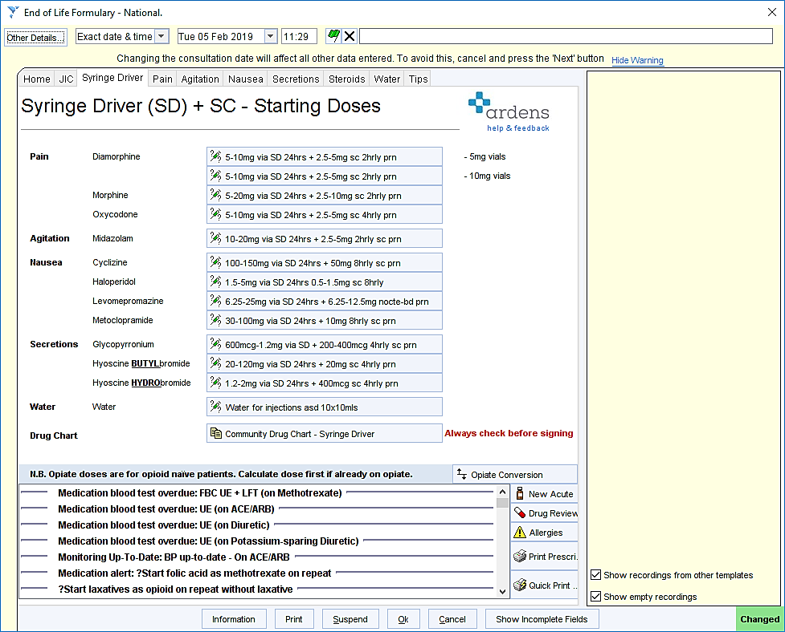 With Ardens Pro certain formularies can be localised for your CCG. For example, the Isle of Wight CCG has a localised End of Life Formulary which has helped standardise prescribing and has also provided cost savings. The CCG and/or GP Practice just need to inform Ardens of any specific changes to the existing Ardens formularies that are required. We will then makes these updates and ensure a Clinical Governance process is followed. Local CCG formularies can only be provided if a direct relationship is held between Ardens and the CCG Medicines Management team. For further information, please see this Support Desk Article. 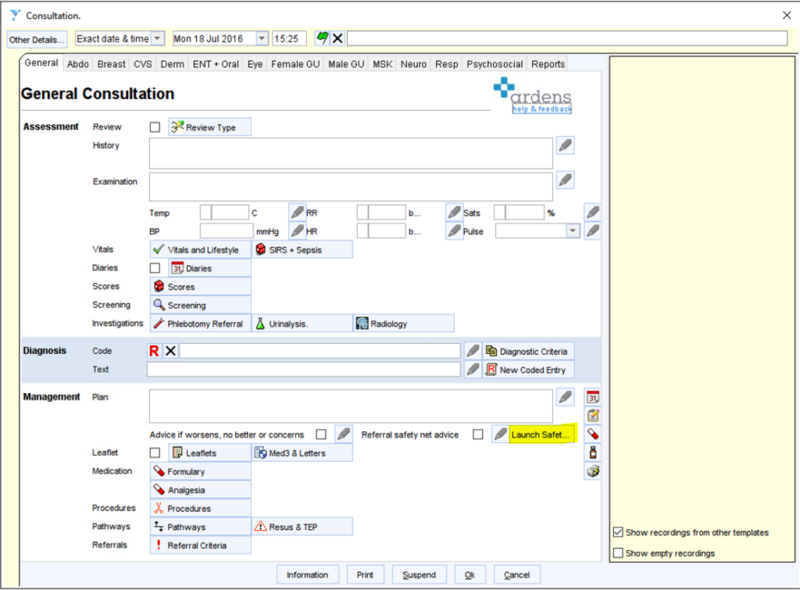 With Ardens Pro referral forms can be localised for your CCG. 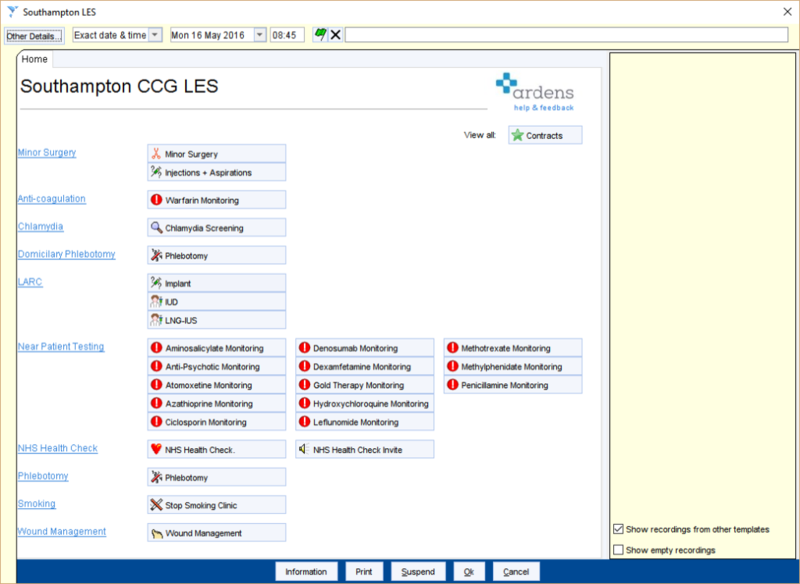 For example, Portsmouth CCG now have all their urgent 2 week wait, routine, prior approvals & community referral forms easily accessible all in one place. This has helped standardise & improve the referral process. The CCG and/or GP Practice just need to inform Ardens of any new referral forms or changes to existing forms. We will then make these updates, saving you time and hassle. A Directory of Services can also be provided but is dependent on the CCG having a ‘SystmOne CCG Reporting Unit’ and granting Ardens the appropriate access rights to this unit. In most cases, we will only be able to provide this service if your CCG has a contract with Ardens. If you have any CCG or locality pathways, simply forward these on to us. We’ll ensure they are incorporated in Ardens so that they can be easily accessed & followed. Keeping on top of the seemingly ever changing local Prior Approvals can be a real chore. With Ardens Pro we do this all for you, freeing up yet more of your valuable time.